Imports Some of these items are imported and will take 4-6 weeks to be delivered if not in stock. We hope to have a stock system on the website soon. Adam greaves are a little bit shorter than the others from other lines. Because of this they will also fit adolescents or smaller people. Additionally, like all the other "Adam" armour parts, they are corrugated along the rim. 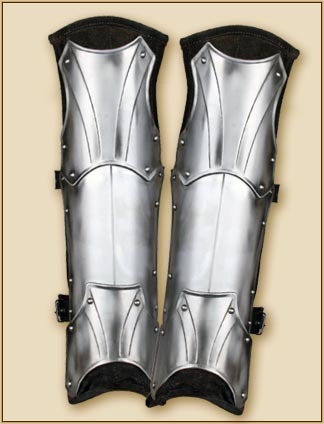 As with all other products from the "Balthasar" line, these greaves have a rim decorated with rivets. The combination of a rounded outline and decorative elements make them look both noble and warlike. A pair of Dark Drake greaves in 1mm Epic Dark Metal. 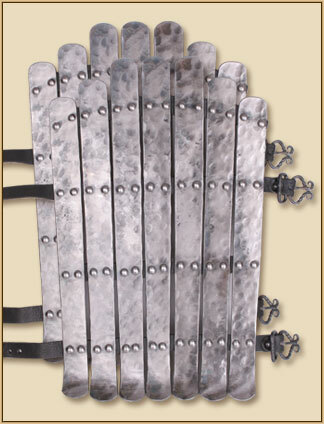 Epic Dark Metal greaves in 1mm steel with plain leather straps. 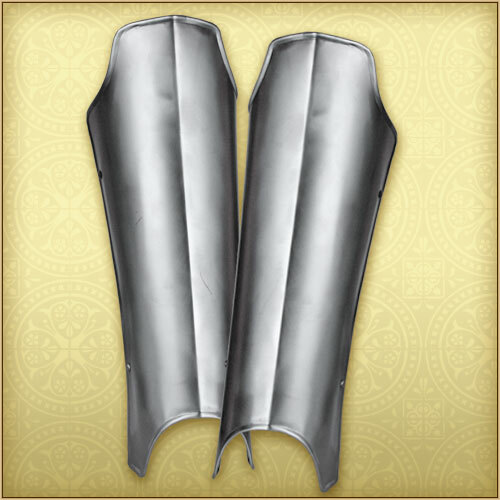 The matching greaves of our armor series Edward. Like all pieces from this series the offset border and the decorative rivets make them a real eye-catcher. 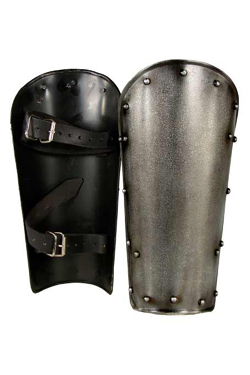 A pair of enclosed greaves in 1mm steel with plain rivets and leather straps. 1 size only. 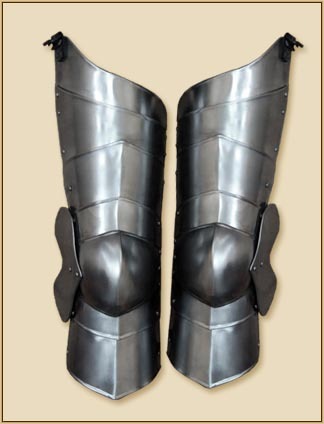 These greaves are made of metal plates riveted on a backing of padded suede leather: This makes it a very comfortable piece of armour. 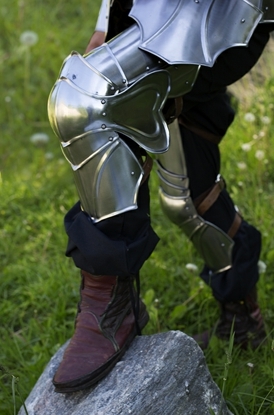 Even when wearing your armour for hours, while marching or running, "Fafnir" will still be quite comfortable. The "Gustav" greaves are a real specialty. The characteristic cut is simple jet has a useful contra curve at the bottom, that gives some extra space for moving your ankles. 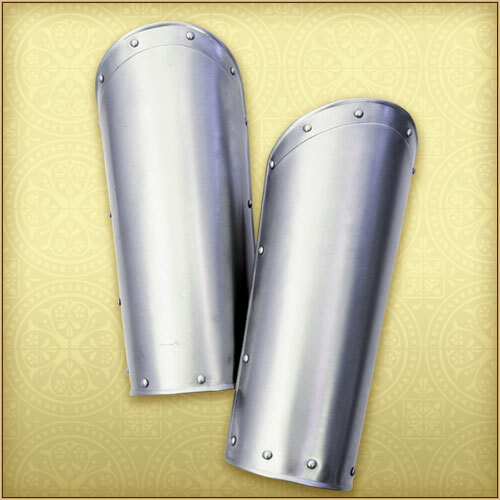 A very effective and comfortable pair of greaves. 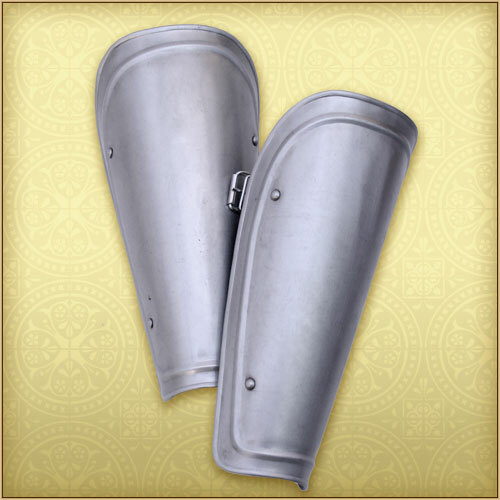 A pair of 1mm steel greaves fit for a King. 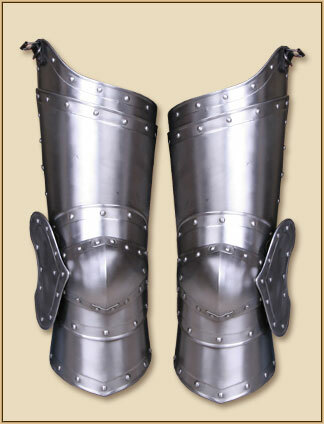 These are the "Markward" greaves, compatible to the rest of our "Markward" armour parts. They might be unadorned, but they look lean and elegant. A pair of Ork greaves in 1mm steel with leather straps. Available in 2 colours, Rust and Green. 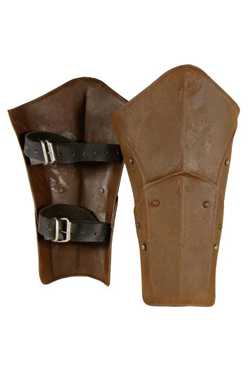 These greaves were made following historic nordic examples.The seven single steel strips are riveted onto two leatherstraps and are closed by two buckle-straps with wrought iron buckles. 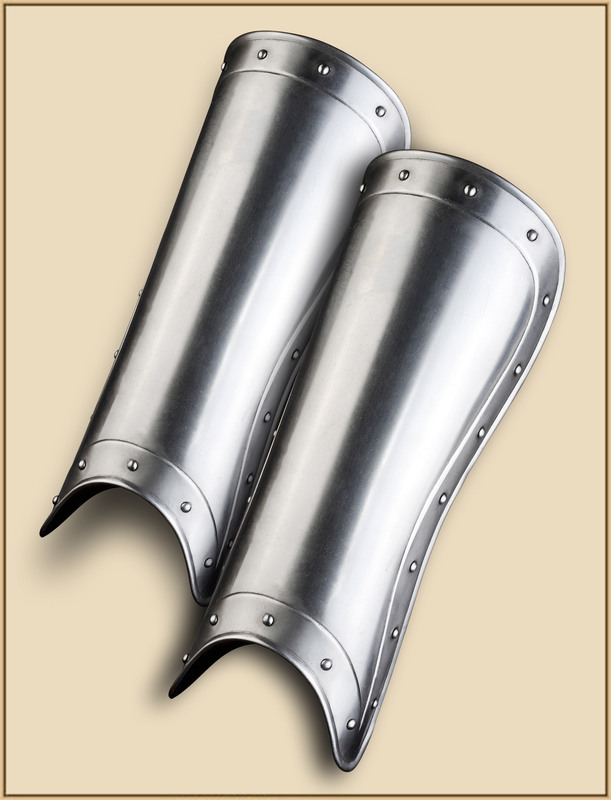 A pair of simple steel greaves. "Vladimir" greaves are composed of many curved segments. 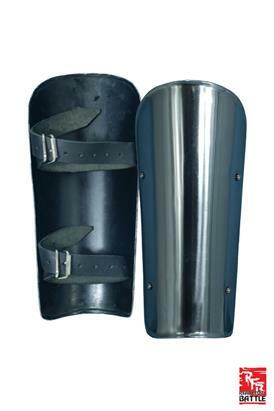 The knee piece is attached flexibly so that it cannot hinder your movements. 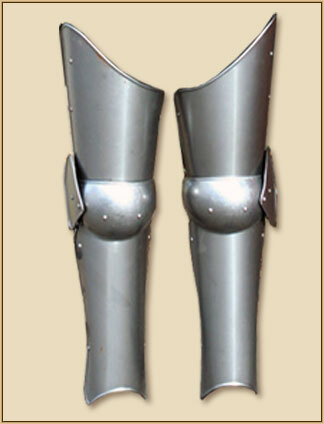 A special feature of these greaves is that they embrace the calves as well. Steel greaves in 1mm steel with plain rivets and leather straps. Price varies with size. 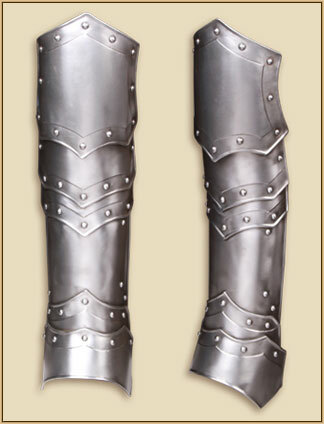 The knee armour "Conrad" is a fantastic add-on for a warriors full body armour. 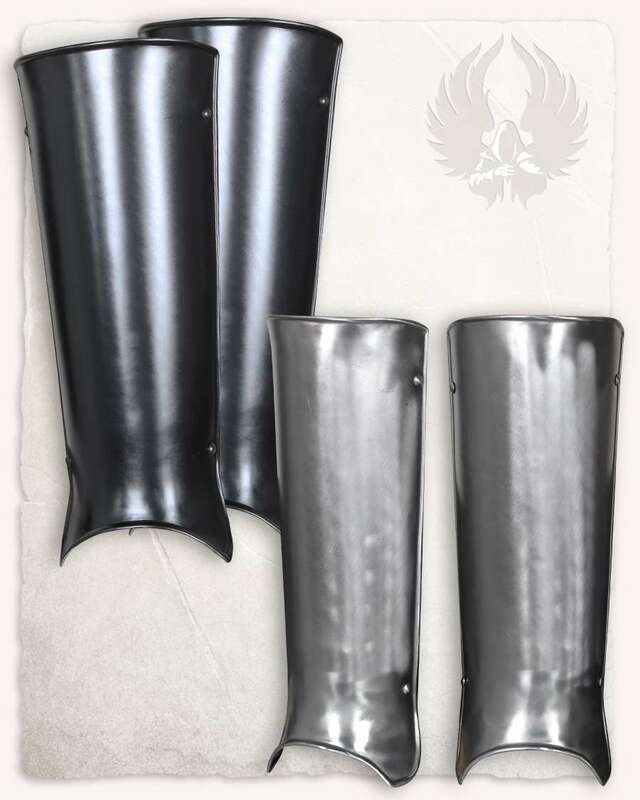 They are very flexible and make every mercenaries or warriors costume look more complete.The knee armour is adjusted with three buckled straps. 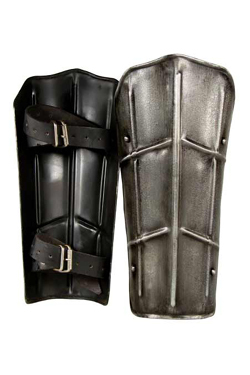 These full leg plate armours from the "Elias" series protect your legs from ankle to the upper thigh. The knees have a joint and therefore do not interfere with movement. 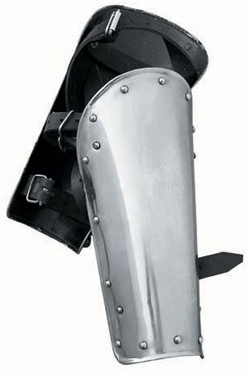 Epic Armoury’s Gothic Leg Protection consists of cuisses to protect the lower thighs, articulated poleyns covering the knees, and half demi-greaves protecting the upper shins and sides of the calves. Don’t be brought to your knees but stay on your feet! 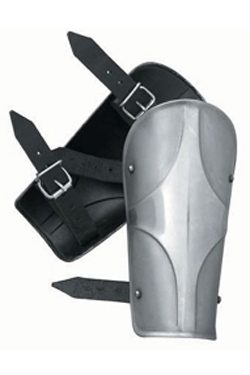 With a pair of Floating Knees you effectively protect an otherwise vulnerable and exposed part of your body. Three leather straps--one around the thigh, one below the knee, and one to attach to the belt--are used to keep each piece in place. Made of 1 mm thick mild steel and top-grain leather straps and fitting. 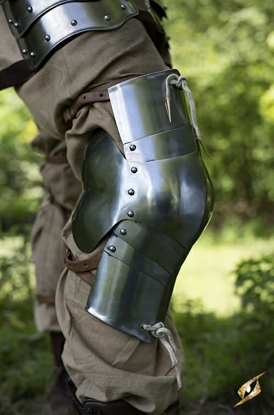 A simple, but effective, armour for thigh and knee. 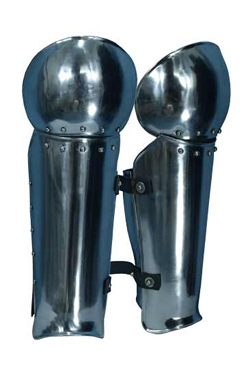 Easy to combine with greaves.The armour is strapped to the wearers hip by using belts.